With analytical planetary influence in your house of work, expect lots of little amendments and changes all this month . With the love planet, Venus, in Capricorn and your career house, you are feeling a little lazy and even unpredictable. Unexpected admirers pop up and an unusual invitation to a party comes your way. Some home repairs need attending too. They are overdue. Get them attended to, and then you can have the fun. A good time to put yourself about socially. Planets in your house of financesÂ– and with Mercury retrograding there - bode well for re-affirmations of your power to earn money. If you have recently given up expecting the latter you may well be in for a nice surprise. Question is how to invest wisely. Activity now in both your financial and communications houses right through December encourage you to forge ahead and ask for your needs. Jupiter supports new ventures. With Mars in your house of past and your family links arena for many months now, make the most of this insightful energy. At the same time with the Sun in Sagittarius transiting your ' partnership' arena there will be a nice balance with your need for pacing yourself and self reflection. You feel like advancing your goals and finances in late November, but please donÂ’t rush decisions or risk take until Mercury your ruling planet goes direct on 14th. Dscernment helps! A mental peak for you with the Sun in and Mars and Mercury in your house of work. Mars in Virgo now time allows you to feel more eloquent>. Above all to feel self love. So, how about letting yourself off the hook and really enjoying yourself? Speaking your mind will pay off as well. It is the best time to forge ahead, so allow life to guide you and in the meantime make plans which can be flexible. These will work out beautifully. The new Moon on Dec 24th inspires you to be more philosophical. People will want to be around you more than usual this Xmas. 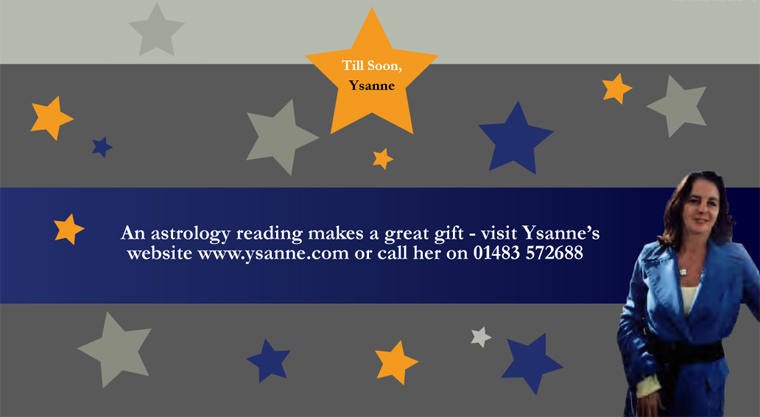 With lovely Venus in your employment' house now do make the most of this gracious time. Communications from the past crop up, even a letter or email that mysteriously got lost 'in space.' You will smile when that happens! You may be feeling more extravagant now, so with the Sun in in your play house as well, okay, nothing I say will make any difference. But donÂ’t go over the top whether with a purchase for self or a generous gesture to someone else. Lovers from the past appear, but do you want them? Your time to reflect, take a step back maybe. The retrograde movement of your ruling planet Mercury is asking of you to take stock of your values Â– if you feel you have been compromising them a bit. People are not less important than you but they are certainly not more important. Maybe some fresh air in the arena of friendships is needed. And a re-evaluation of past and present associations. The 10th is a day of realisations and breakthroughs. Mars in your sign till next July should well and truly energise goals. With Mercury, god of communications in fiery Sagittarius, what fun you can have this month ! You can play with words and be inventive with concepts. People will find you more enjoyable than usual because of this. Fancy writing a book or short story? A new work opportunity rears its head. You will be noticed in the Â‘higher ranksÂ’ and it is important you don't hide your light. A friendship will be growing into something more romantic. Take your time with this. Friends and groups play an important role this month. Your future vision is finely tuned now and you are starting to see the significance of a long term plan. The folk around you are wise souls at present and will give you good counsel if you need it. A long standing dream to travel to a particular place increases and getting information regarding it comes to you. The eclipse on December 10thth sees a start of of a project. You are ready for this . Try to tie up loose ends now as with Uranus, activating your work arena, going 'direct' after retrograding for many months past, you can expect a whoosh forward of events. Planetary - Mars - activity at the top of your chart suggests you get your ambition up and running and get out of any rut you may be in. Re-apply for some position, ask for an opportunity to display your gifts and put your best face forward. You have until mid January time to do this! All sounds a bit exhausting? Don't worry Â– your sense of adventure is in good shape and a risk here or there will pay off. Mars is reminding you to investigate your deepest motives and desires Â– get clear on what you want. Fancy a bit of travelling or higher education? Your mind is being stretched now and you won't be satisfied with small matters. Hiccups recently at work will get resolved but only if you stand up for yourself. Uranus going direct on Dec 12th, with the Full Moon to assist, energises and provides good timing for ventures. Be clear. Mars, the action man within you, is stirring up your need for action in your travel or study plans and decision making. You are going to be surprised how strong you are. The Sun in Sagittarius, along with Mercury , is doing its yearly visit to the area of your chart where you will discover latent dreams, talents and futuristic thinking. Don't suppress the feelings Â– as new awakenings lead to exciting pastures. Just be careful of projecting your issues and fears onto loved ones. Claim them for yourself and transform them. Mars is in your joint finances house and ideas and passions re goals are highlighted. After 14th, go for it! With your ruler Uranus, going direct on 10th December, you can act more unconventionally then and feel freer. Planetary activity in your relationship sector, says to you 'what are you waiting for?' The time to reflect, not initiate too much and await the upward swing which has been dogging you is over. And having said that, it really is a good time for creative activity and working on your self image. Finances owed you are returned or an investment pays off. Your spiritual side is prompting you a lot in the way of answers. Listen to it! If you are in a major relationship, it may need an overhaul or some fresh air. Good discussions ensue. Venus in your friendship area is making you a bit restless so make plans for innovative team work.